The above sms was sent to me recently by an ex-ordinary office girl. 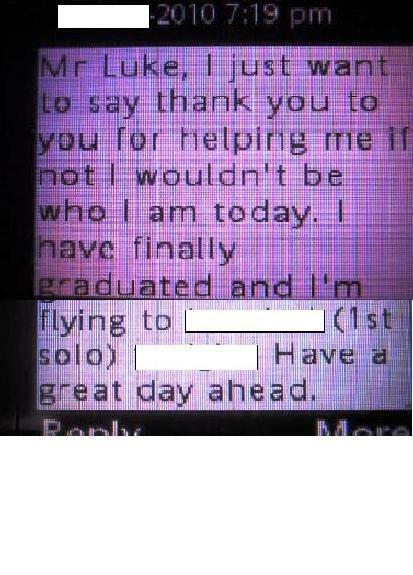 I coached her and she passed her SQ cabin crew interview. 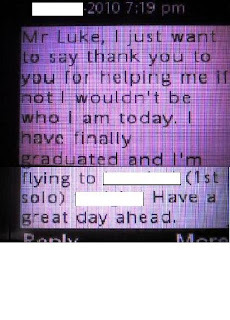 She failed 4 times in her interviews before she came to see me.In the above sms and in her telephone conversation with me she've expressed her gratitude for helping her to be an SQ girl.Besides her (from Singapore),I have also helped many guys and girls from as far as Indonesia,Malaysia,Taiwan and India to become cabin crew with SIA,CX,EK and MI to be flight attendants. Great that you have made such a positive impact on someone's life. Keep it up, BT! Hope her life would be a better one than before.